This paper presents Chapter VI (section 5) from the book THE NATURE OF THE PHYSICAL WORLD by A. S. EDDINGTON. The contents of this book are based on the lectures that Eddington delivered at the University of Edinburgh in January to March 1927. The paragraphs of original material are accompanied by brief comments in color, based on the present understanding. Feedback on these comments is appreciated. The heading below links to the original materials. The argument in this chapter rests on the relativity of acceleration. The apple had an acceleration of 32 feet per second per second relative to the ordinary observer, but zero acceleration relative to the man in the lift. We ascribe to it one acceleration or the other according to the frame we happen to be using, but neither is to be singled out and labelled “true” or absolute acceleration. That led us to reject the Newtonian conception which singled out 32 feet per second per second as the true acceleration and invented a disturbing agent of this particular degree of strength. It will be instructive to consider an objection brought, I think, originally by Lenard. A train is passing through a station at 60 miles an hour. 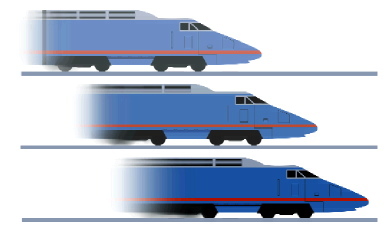 Since velocity is relative, it does not matter whether we say that the train is moving at 60 miles an hour past the station or the station is moving at 60 miles an hour past the train. Now suppose, as sometimes happens in railway accidents, that this motion is brought to a standstill in a few seconds. There has been a change of velocity or acceleration—a term which includes deceleration. If acceleration is relative this may be described indifferently as an acceleration of the train (relative to the station) or an acceleration of the station (relative to the train). Why then does it injure the persons in the train and not those in the station? Much the same point was put to me by one of my audience. “You must find the journey between Cambridge and Edinburgh very tiring. I can understand the fatigue, if you travel to Edinburgh; but why should you get tired if Edinburgh comes to you?” The answer is that the fatigue arises from being shut up in a box and jolted about for nine hours; and it makes no difference whether in the meantime I move to Edinburgh or Edinburgh moves to me. Motion does not tire anybody. With the earth as our vehicle we are travelling at 20 miles a second round the sun; the sun carries us at 12 miles a second through the galactic system; the galactic system bears us at 250 miles a second amid the spiral nebulae; the spiral nebulae. … If motion could tire, we ought to be dead tired. Similarly change of motion or acceleration does not injure anyone, even when it is (according to the Newtonian view) an absolute acceleration. We do not even feel the change of motion as our earth takes the curve round the sun. We feel something when a railway train takes a curve, but what we feel is not the change of motion nor anything which invariably accompanies change of motion; it is something incidental to the curved track of the train but not to the curved track of the earth. The cause of injury in the railway accident is easily traced. Something hit the train; that is to say, the train was bombarded by a swarm of molecules and the bombardment spread all the way along it. The cause is evident—gross, material, absolute—recognised by everyone, no matter what his frame of reference, as occurring in the train not the station. Besides injuring the passengers this cause also produced the relative acceleration of the train and station—an effect which might equally well have been produced by molecular bombardment of the station, though in this case it was not. Velocity is relative because it requires an external reference point. This is not so with acceleration, which is referenced from the body itself. Therefore, acceleration is always absolute. It cannot be looked upon in relative terms. If there is an absurdity in taking hold of the wrong end of the relation it has passed into our current speech and thought. Your suggestion is in fact more revolutionary than anything Einstein has ventured to advocate. Let us take the problem of a falling stone. There is a relative acceleration of 32 feet per second per second—of the stone relative to ourselves or of ourselves relative to the stone. Which end of the relation must we choose? The one indicated by molecular bombardment? Well, the stone is not bombarded; it is falling freely in vacuo. But we are bombarded by the molecules of the ground on which we stand. Therefore it is we who have the acceleration; the stone has zero acceleration, as the man in the lift supposed. Your suggestion makes out the frame of the man in the lift to be the only legitimate one; I only went so far as to admit it to an equality with our own customary frame. The idea of frame of space is flawed from “continuum of space” perspective, because there is no completely empty space. Space represents the extensions of substance, which is either material-substance or field-substance. Your suggestion would accept the testimony of the drunken man who explained that “the paving-stone got up and hit him” and dismiss the policeman’s account of the incident as “merely spinning paradoxes”. What really happened was that the paving-stone had been pursuing the man through space with ever-increasing velocity, shoving the man in front of it so that they kept the same relative position. Then, through an unfortunate wobble of the axis of the man’s body, he failed to increase his speed sufficiently, with the result that the paving-stone overtook him and came in contact with his head. That, please understand, is your suggestion; or rather the suggestion which I have taken the liberty of fathering on you because it is the outcome of a very common feeling of objection to the relativity theory. Einstein’s position is that whilst this is a perfectly legitimate way of looking at the incident the more usual account given by the policeman is also legitimate; and he endeavours like a good magistrate to reconcile them both.